The Fourth of July is a big day for grilling in the US–although just about any summertime evening when it isn’t storming makes a pretty compelling candidate. I love grilling foods, from meats, fish, and shellfish to vegetables and fruits. More than that, I like to create my own marinades and sauces with the herbs I grow. If you’re looking for something fresh, summery, and different that’s also extremely easy to make, give my lemon balm pesto a try. Lemon balm (Melissa officinalis) is an herb in the mint family. Its small white flowers attract bees and other pollinators, but you’ll be drawn by the lemony scent of the foliage as you brush it with your fingers. It is reputed to be effective as a mosquito repellant when the leaves are rubbed on the skin. But more than all of that, you’ll like the bright lemon flavoring the leaves lend to salads, drinks, and marinades. It has endless uses in the kitchen. 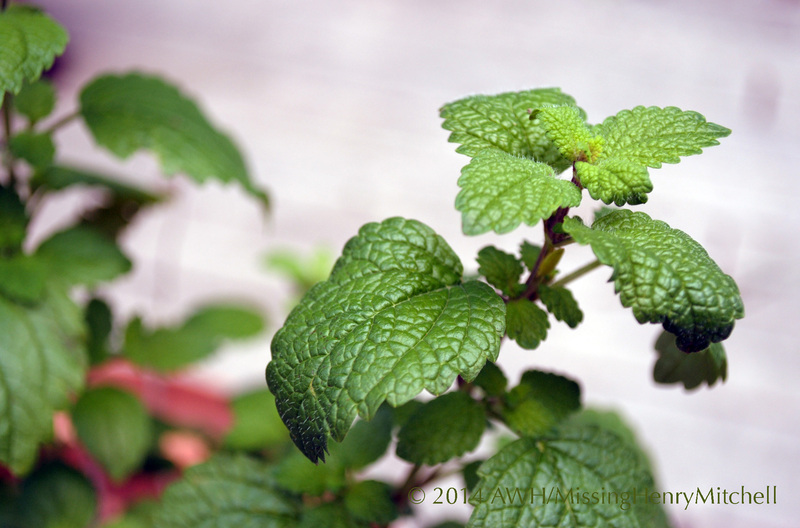 Lemon balm grows easily to 3 feet tall in sun or shade. It spreads like its mint relatives, so grow it in a container of well-draining potting soil mixed with compost. It does not require fertilizing, and is quite stoic in drought but delights in regular rain. One plant should be plenty for you, unless you run a busy restaurant or keep bees. In those cases, two plants should suffice. Put the first three ingredients and a pinch of salt and pepper into the bowl of a food processor or blender. Start the blender, and drizzle olive oil into the mix until the mixture is the texture you like. If you want your pesto extra-lemony, add a squeeze of fresh lemon juice or lemon zest. Add more salt and pepper to taste. Spread on chicken, fish, or shrimp before putting the food on the grill, or allow foods to marinate in the pesto in the refrigerator overnight. For overnight marinating or for brushing on food on the grill, a thinner mixture works well. I like a thicker paste as a garnish on finished dishes. It also tastes great as a salad dressing when tossed with greens, olives, peppers, and a bit of goat cheese, or as a spread on crusty bread. The pesto may be kept in the refrigerator for a week, or may be frozen for later use. The pesto may slightly discolor as it freezes, but it will taste just fine. Hope you enjoy your holiday grilling! This entry was posted in 2014, Edible Plants, Garden plants, Herbs, Recipes, Sauces and tagged gardening, grilling, grow your own food, herbs, pesto, recipes, summer gardening, vegetables by missinghenrymitchell. Bookmark the permalink. The answer to my prayers! I have lemon balm growing everywhere! Participating on Monday’s #gardenchat on Twitter, I discovered this recipe and cannot wait to try it! This looks sooo good! I’m going to try it on a crusty bread, I think. Thanks for posting!